15 Day Cuba Tour - Canchánchara to Cucurucho Starting at US$2350 / person. 14 nights in privately owned comfort class Bed & Breakfasts (casas particulares), double occupancy. Private transportation in air conditioned bus. Domestic Flight. Included Activities Playa Giron museum & documentary film, Bay of Pigs snorkelling, Cienfuegos orientation Walk & visit to Castillo del Valle, Che Guevara Mausoleum, Walking tour of Trinidad historic center, Bartending Demo, introductory group Salsa Lesson, Walk to Javira waterfall, Camaguey walking tour involving Art Galleries & Market Garden, Camaguey bicycle taxi tour, Casa de la Trova music house visit, Camaguey Ballet School (or alternative dance school) visit, half-day Santiago city tour, Santiago Music Tour visiting traditional music houses with a local expert, Visit to Los Hoyos Conga school, Santiago group Dance Lessons (or attending a dance or music rehearsal, or visiting an art school), interactive night with local musicians and dancers in local club, Baracoa orientation walk, Visit to Toa River & Duaba farm, Cooking Lesson, Visit to locally owned Cacao Farm, Yumuri river canyon tour, El Morro castle entrance, Old Havana half-day guided walk visiting commercial centers & ration stores, local Havana urban organic farm visit. All breakfasts, 9 lunches, 7 dinners. Airport arrival transfer. Private local Cuban guide throughout. PLEASE NOTE: Due to domestic flight availability, tour may run in reverse. Canchánchara and cucurucho are fun to say, but even better to savor! Both are delicious regional specialties, the former is a “healthy” drink made of lime, honey, and rum served in clay cups popular in Trinidad, the latter a Baracoan sweet made of coconut and wrapped in banana leaves. This tour journeys from the west to the east of the island where you will visit cultural and historic sites and meet artists and musicians. 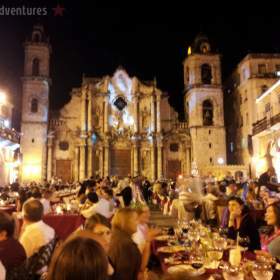 In addition, you will experience the diversity of Cuba through food and drink. Many people are pleasantly surprised by the quality and variety of food available in Cuba (even for vegetarians! ), and now that the government has legalized privately owned restaurants, Cuba’s culinary status is on the rise! From the cosmopolitan cuisine in Havana, to the creole flavors of Baracoa, learn how the region’s history, geography, and industry reflect on the local cuisine. Welcome to Cuba! Settle into your B&B accommodations in the old city. Today you'll meet with your group and your local tour leader for have dinner together at a paladar (privately owned restaurant). On the way Cienfuegos, the Pearl of the South you will see the picturesque Bay of Pigs where there is a museum here that recounts the events of this conflict which resulted in the first defeat of a U.S backed take-over in Latin America. There are some beautiful places to stop for a swim along the way, including a sink hole which resembles a huge natural tropical fish tank or you can snorkel in the bay. On arrival to Cienfuegos we meander through the city to learn its history. In the evening we will eat at a family owned paladar where they have an excellent vegetarian paella. On the way to Trinidad we stop in at the town of Santa Clara, a key city in the Cuban Revolution. Upon entering Santa Clara, we will see the iconic statue of Ernesto Ché Guevara, built to commemorate his death and that of the revolutionaries who died along with him in Bolivia. We will have our lunch at a small family farm near Santa Clara before we continue on our journey to Trinidad. The beautiful colonial city of Trinidad is home to numerous churches and many beautiful colonial buildings. On our first day in Trinidad we learn about the Afro-Cuban religion with a cultural tour around the city, and then set our sights on the Trinidad foodie scene including a bartending demonstration and discussion of the history behind Cuba’s most popular cocktails. Afterwards, we will head to a local dance school for a demonstration and lesson in the dances of Cuba. A visit to Trinidad wouldn’t be complete without a night of dancing and music, and what better way to burn calories and practice what you’ve learned! Today's theme is local industry and biodiversity as we take a short hike to a waterfall outside of the city. On the way we stop in a very simple campesino’s home to learn about life in the rural areas of Cuba. After cooling off in the natural pools, we return to Trinidad where you’ll have the rest of the afternoon to relax and explore. For dinner tonight we will have a special meal (perhaps on the beach!) with live music and a delicious array of Cuban specialties. 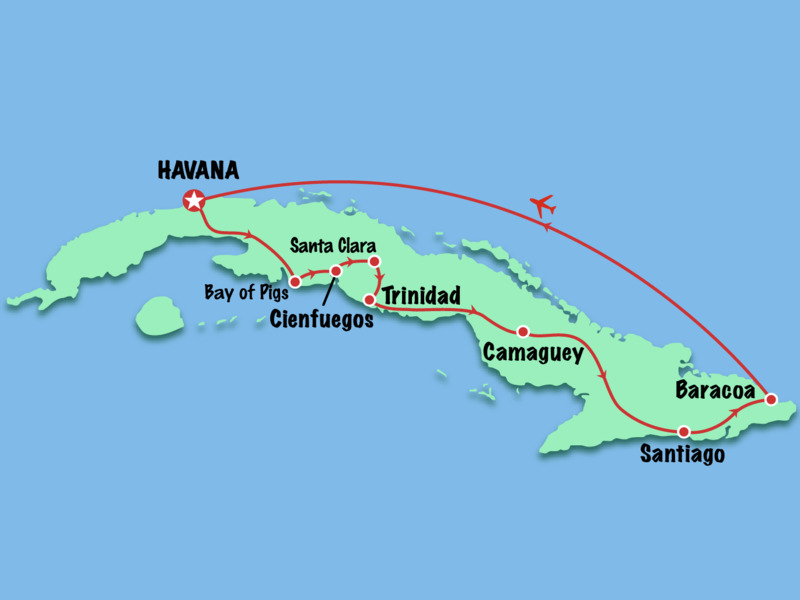 Cuba’s third largest city lies about half way between Havana and Santiago de Cuba - about a 5 hour drive from Trinidad. Camaguey was designed in the 17th century to disorientate potential invaders such as pirates and plunderers, so the street layout is a jumble of narrow alleys where no two streets are parallel. The guided tour will take you to the large parks, various private art galleries, and a thriving market garden. This is also a university town and has a rich cultural tradition, and like just about everywhere in Cuba, there is plenty of night time entertainment to be had! We continue to explore Camaguey on a bicitaxi tour of the city- a fun way to navigate the labyrinth of streets. In the afternoon there will be fun optional people to people activities for you to choose from, such as visits to local galleries or dance and music performances. In the evening we will visit Casa de la Trova (optional) to listen to live performances from legendary local artists. Today we take an early morning visit to the Camaguey ballet school en route to Santiago de Cuba. Santiago is the place of origin to much of Cuba’s famed music, like the Son. We will explore Santiago’s museums, colonial churches and buildings of more recent historical importance, such as the Moncada Barracks. Santiago also holds the title of “Hero City of the Republic of Cuba” for its leading role in significant events during the revolution. The city’s half million residents are also proud of their cultural traditions and you will find many museums and cultural associations and clubs around the city. Today is all about experiencing the rhythms of Santiago de Cuba. Tour music venues with a well-respected local expert in the arts and delve into the music scene first hand. Learn about Cuban street rumba, danced during Santiago’s famous Carnaval. We’ll take advantage of spontaneous opportunities to appreciate Santiago’s local talent, whether it be attending a rehearsal of a famous choir, or perhaps visiting the most inclusive art school in the country to meet students studying dance, visual art, music, and…magic! The day will end with an unforgettable night of music and dance with local Santiagueros. 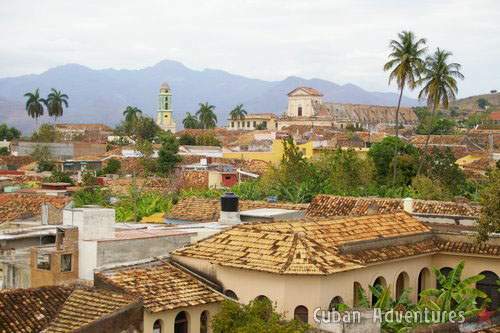 A spectacular 6 hour drive through Eastern Cuba’s hugely varied landscape brings us to the Cuba’s first capital. On the way we pass by the city of Guantanamo and its infamous bay nearby. There is a lookout from where you can see the highly controversial U.S. Navy Base - Mirador los Malones - this has been closed to the public for the last few years but we will see if we can arrange for you to take a peek! We will also stop at a local home and learn about cucurucho, a sweet treat made of honey, nuts, and coconut that is as much fun to eat as it is to say! After the long bus ride, you’ll need to stretch your legs. Luckily, the best way to get around town is on foot and we will visit places like the Catedral de Nuestra Señora de la Asunción, with the impressive bust of the Indigenous leader Hatuey (burned at the stake for his refusal to accept either the Spanish, or their Catholic religion). You are free for dinner tonight, and recommend a home cooked meal of the local specialty fish in coconut sauce from your casa. 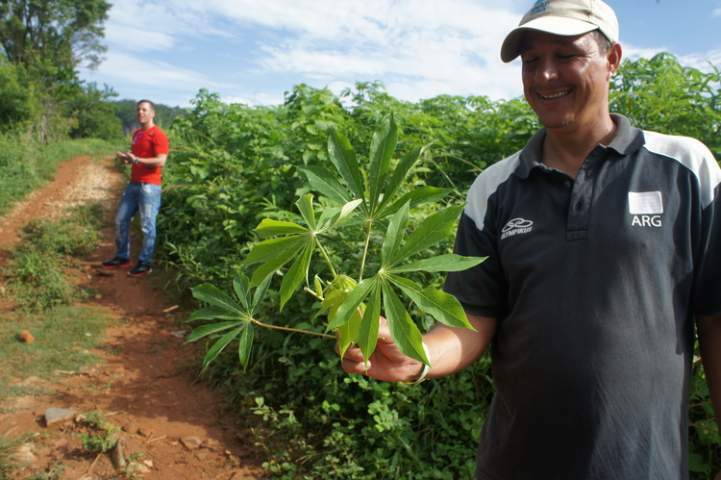 Today we visit Finca Duaba, where you’ll get a lesson in all the plants and trees grown in Baracoa and the ingenious uses for them. Baracoa grows some of the most delicious fruits found on the island; don’t miss the opportunity to sample the native fruits, and even a termite or two if you dare! Later we take a relaxing ride down River Toa to see the beautiful view of El Yunque “The Anvil”. In the evening we will meet with a local chef for a delicious demonstration in Baracoan cuisine. Baracoa is known for its excellent creole cooking and seafood. Vegetarians can enjoy calalú, a typical Baracoan dish made with vegetables and coconut milk. When Christopher Columbus first encountered Cuba it was here in Baracoa, and he duly noted in his log-book that this was the most beautiful land that human eyes could set upon. You will understand what he meant when you see the beaches and verdant mountains that surround the city. Today we will journey outside of town on a visit a family-owned cacao farm to learn how Baracoa’s famous chocolate is made. Then we will take a ride down the Yumuri river and enjoy meeting the colorful locals who live and work on the river. Today you’re free for dinner, we suggest you feast on tetí, tiny fish that are a regional specialty very unique to Baracoa. Save room for dessert or a chocolate mojito at Casa del Chocolate! Our flight to back to the Capital leaves around noon and takes about 1.5 hours, although frequently there are delays. We usually leave for the airport at around 10.30am and arrive in Havana at about 4pm. You’re free for dinner today and then tonight we will attend the famous cannon ceremony that dates back to the 17th century. Back in Havana it’s time to explore the Old City, with the picturesque malecon and iconic architecture. In the morning we take a guided walking tour of Old Havana. In addition to visiting historical sites, we will learn about the dual currency system and how it plays out in the local food scene, from Cuban street food to the finest restaurants. As we wander the city, sampling a few of Havana’s delicious treats, we’ll discuss the way the legalization of private enterprise has made way for a culinary renaissance in Havana. In the afternoon we visit one of the local organoponicos, urban farms that turn unused space into healthy and affordable food for a community. Say good-bye to Cuba as you head home to the U.S., or wherever your travels will take you. We hope you'll come visit again soon! Prices start at US$2350 per person. Optional Single Supplement US$445. We welcome solo travelers! You don't pay a single supplement unless you want to guarantee your own room. Read more about the single supplement. We require a US$400 per person non-refundable deposit to reserve your place on the tour. The remaining balance is due 60 days before the tour departs.